Tune in July 26 9/7C on SCI FI Channel! A job with Donald Trump? Pah. This competition, starting its second season, has the coolest prize yet: The winner is immortalized in a comic book and an action figure of the superhero he or she has created. 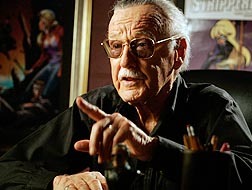 But first, the contenders have to prove themselves worthy to comic mogul Stan Lee. This year's wannabes include Hygena, who fights crime with cleaning supplies; Mindset, a telekinetic time traveler; and Hyper-Strike, a martial artist with something extra. Share your email address with us and we'll keep you posted on the latest announcements with our mailing list! You are currently visiting the Season 2 webpage. Click here to go to the website for Season 1. Check out some video clips from season 1, including footage never seen before! Order your copy of "Who Wants to Be a Superhero?" on DVD from the NBC Universal store.